Its great to see sports cards included in a nationwide television commercial. I’m betting many people have thrown these packs out not realizing they have a small chance at a Michael Jordan autograph. I saw this on T.V. for the first time yesterday. Every single day all over the world packs and boxes of trading cards are opened. Its a hobby enjoyed by many. To some it can be an addiction. The idea of what could be in that next pack or box can be too tempting to ignore. If it weren’t for the tobacco industry and their pack inserted cards, there is a good chance this hobby of ours wouldn’t exist. What is the first pack-inserted tobacco card? The gentleman who has the honor of being on the first pack-inserted tobacco card is John George Edward Henry Douglas Sutherland Campbell. Good luck fitting that name on a jersey. This dude was into a little bit of everything. He was well traveled, well educated, and even married Princess Louise, the fourth daughter of Queen Victoria. Titles he held included being the 9th Duke of Argyll, and Marquis of Lorne. Between 1878-1883 the Marquis of Lorne was serving as the 4th Governor General of Canada. Quite impressive considering he was a British nobleman. The Thos. H. Hall cigarette manufacturer of New York at this time decided to include a tobacco card of him in their Marquis of Lorne brand of cigarettes in 1879. Unfortunately this brand didn’t sell well, and it quickly flamed out. Very few cards survived. It measures 3.125″ x 1.625″, the exact size of the cigarette packet. The American Card Catalog officially classifies it as N519. As of this writing, only four examples are known to exist. One is in New York’s Metropolitan Museum of Art. Another is in the British Museum in London. The other two are in private collections. Only one of the four known examples has popped up for sale. The same card has been sold twice. In 1994 it sold for $11,500, and then again in 2009 for $15,275. I believe it would be worth even more if it were of a sports figure. I can’t stress how important this tiny piece of cardboard is to the hobby. Prior to the 1879 N519 Marquis of Lorne card, advertisements such as this were handed out over the counter. Not inside cigarette packs. Despite the Marquis of Lorne cigarette brand not making it, the idea of cardboard inserts did. You probably wouldn’t be opening that box or pack if this card wouldn’t have been printed. Everything pretty much snowballed from this single card. Starting in 1880, many more tobacco inserts followed. Created by Bob Kane and Bill Finger, Batman made his debut to the world in Detective Comics issue #27. The date on the cover states “May 1939”, but it was actually released in March of that year. 2019 marks Batman’s 80th anniversary. For the last 80 years Batman has been fighting one evil-doer after another in order to keep Gotham City safe. 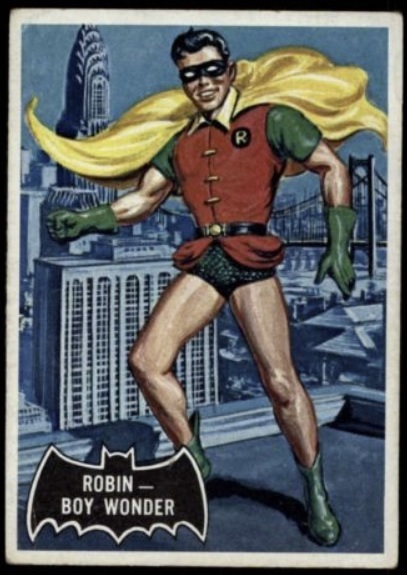 Despite being introduced to fans in 1939, it took until 1966 for Batman to receive what I like to call his “rookie card”. Thanks to the success of the Adam West and Burt Ward Batman television series, fans saw multiple card sets released in 1966. Topps issued five different sets all based on the campy Batman show. The first is the 1966 Topps Batman Black Bat set. It consists of 55-cards, and the artwork is done by Norman Saunders. Saunders is best known for working on the 1962 Topps Mars Attacks set. Card #1 simply features “The Batman”. They call it the Black Bat set because the picture’s caption is inside a black bat. Other sets released that same year include the Blue Bat, Red Bat, The Riddler Back, and The Bat Laffs. Like most vintage cards, condition is everything. The value of this card can range anywhere from hundreds of dollars to thousands based in it’s condition. Batman will always remain one of my favorite superheros. I was first introduced to him while watching reruns of the old show from the 1960’s. Then I discovered Tim Burton’s Batman starring Michael Keaton. That movie is ingrained into my mind. I prefer my Batman to be much more serious than campy. Growing up, I had tons of action figures. 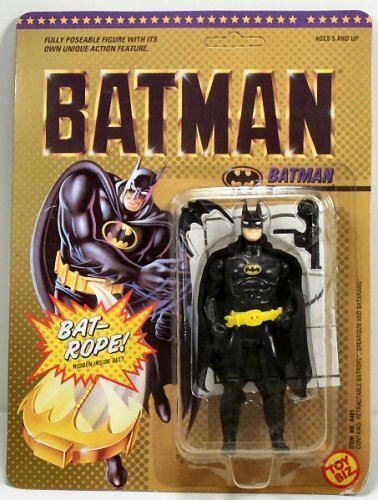 The first one I remember getting was of Batman from the 1989 Toy Biz DC Heroes line. Today’s fans know Batman as a very serious character. Thanks to comics such as Batman: Year One, The Killing Joke, and The Dark Knight Returns, those days of camp are fairly over. Tim Burton’s films also helped, along with Batman: The Animated Series. I wish this card had a more serious tone to it. This image reminds me of what I look like on the opening night of the National Sports Collectors Convention. Batman just looks way too happy. On a side note, wouldn’t it be neat to see Michael Keaton return as Batman? It could be a follow-up to Batman Returns. Even though Batman Returns had two sequels – Batman Forever and Batman & Robin, other than Michael Gough playing Alfred Pennyworth you don’t see a lot of connections to the original two films. Going back like this worked for the Halloween franchise last year. With all of the reboots and restarts DC Comics films are currently going through, its not that far of a stretch for it to happen. In case you were wondering, Robin’s “rookie card” is #2 in the Black Bat set. Lots of famous characters from Batman’s Rogues Gallery have rookie cards in here. Manny Machado In A Padres Uniform – Baseball Authenticated Masterpieces Has It! Two major MLB free agents have been on constant watch this winter to see which teams they decide to sign with. Its no secret that I’m talking about Manny Machado and Bryce Harper. Every single day the rumors would change as to who might be in the lead to land each superstar. As of this writing, Bryce Harper is still up for grabs. I hope he goes to the Phillies. Manny Machado on the other hand has signed a 10-year deal with the Padres worth $300 million. That’s a lot of cheddar. One of his earliest Padres collectibles will come from Piece of the Game’s Baseball Authenticated Masterpieces. Each player in the main set will have (3) game-used, hand-painted, and autographed baseballs. The artist, Monty Sheldon, saved a few Manny Machado and Bryce Harper balls to paint until each player signed with their new team. Baseball Authenticated Masterpieces is scheduled to be released this spring.